Crystal Palace have unveiled plans to move from Selhurst Park to a new 40,000-seat stadium at their original home - now the National Sports Centre. Palace chairman Steve Parish told BBC London: "This is where we started playing in 1905 and we want to bring Crystal Palace home." UK Athletics have backed the plans providing they include a running track. The news could have a major impact on plans by Tottenham to relocate to the site of the 2012 Olympic Stadium. Spurs want to demolish the 2012 stadium and start from scratch while revamping the NSC for athletics. The NSC in Crystal Palace Park is currently a 15,000-seat athletics stadium and hosts the annual London Grand Prix meeting, but it is in need of major refurbishment work. Ed Warner, chairman of UK Athletics, said they would back Palace's plans providing the NSC's athletics legacy was retained. "On the proviso that the Olympics stadium retains its athletics track and any redevelopment of Crystal Palace maintains a community athletics facility on or nearby the park, we would be supportive of the plans of Crystal Palace," he said. Parish added: "We wanted our plans to go into the mix of the decision making process. "There are issues out of our control over what people deem to be an Olympics legacy. "Once the decision has been made we'd look to work with whoever else wants to do something here [at the National Sports Centre] and see if we can make those two things compatible. "It's important people realise what our plans were and that we went public with those. "We believe we can put the funding in place. We own Selhurst Park which will be the cornerstone of that funding." The park was the original home of Crystal Palace FC when the club was formed in 1905 and they played there until the outbreak of World War One. They have been at Selhurst since 1924. 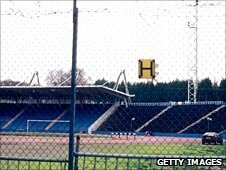 Tottenham's plan to build a new football-only stadium on the site of the main venue for the 2012 Olympics in east London has caused controversy as an athletics legacy was part of London's successful bid to host the Games in 2005. To fulfil that obligation, their plan involves refurbishing the NSC as a 25,000-capacity athletics venue. However, Parish would not commit to keeping an athletics track at the NSC should the Eagles move happen. "Everyone in football would prefer a purpose-built football stadium," he continued. "If you build a stadium with football and athletics in mind [at the start] you can arrive at a much better compromise. "We would explore all options, but a football stadium would be ideal." Premier League side West Ham have submitted their own bid for the 2012 stadium, which would involve them retaining the athletics track for use in elite events as well as by local communities. The Olympic Park Legacy Company has a board meeting on Friday, 28 January when it is expected to decide on its preferred bidder. Its recommendation then has to be ratified by two government departments - the Department for Culture, Media and Sport, and the Department of Communities and Local Government - and the London Mayor's office. Palace were taken over by new owners CPFC2010 last June, when the possibility of relocating from Selhurst Park - parts of which are also in need of upgrading - was raised.